Enclosed is a column of W. Lippman's taken from the D.M. Register which I want put in my scrapbook or letter file somewhere. It is a fine analysis of the necessity of genuineness in public utterance, of the insincerity of him who divorces his actions from his words. I send it not because it is a pertinent criticism of Roosevelt but because I believe it is sound wisdom. 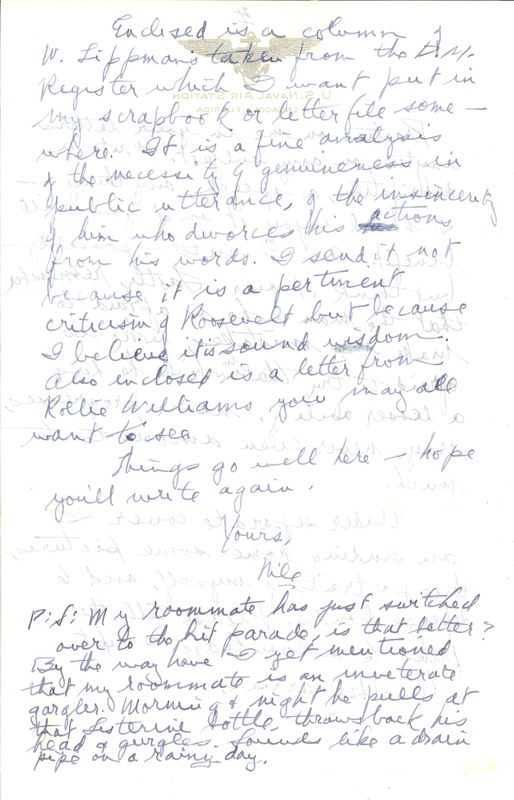 Also enclosed is a letter from Rollie Williams you may all want to see. Things go well here - hope you'll write again. Yours, Nile P:S: My roommate has just switched over to the hit parade, is that better? By the way have I yet mentioned that my roommate is an inveterate gargler. Morning & night he pulls at that Listerine bottle, throws back his head & gurgles. Sounds like a drain pipe on a rainy day.